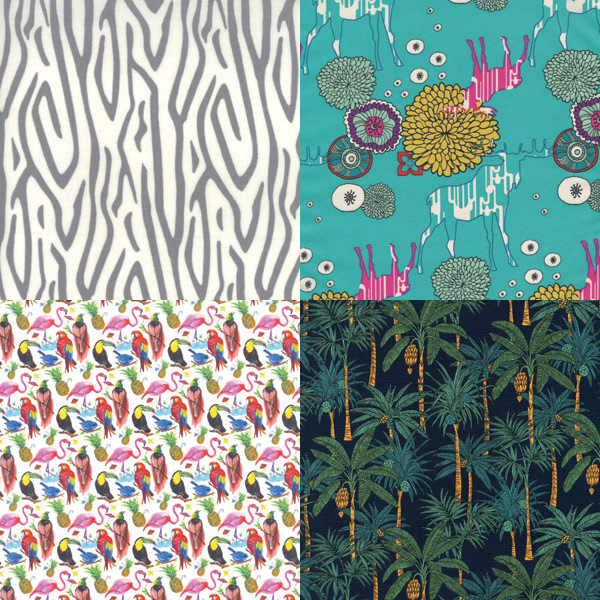 Sevenberry for Robert Kaufman Fabrics ‘Island Paradise’ RK412912 (Maize colourway). Distributed by Two Green Zebras. 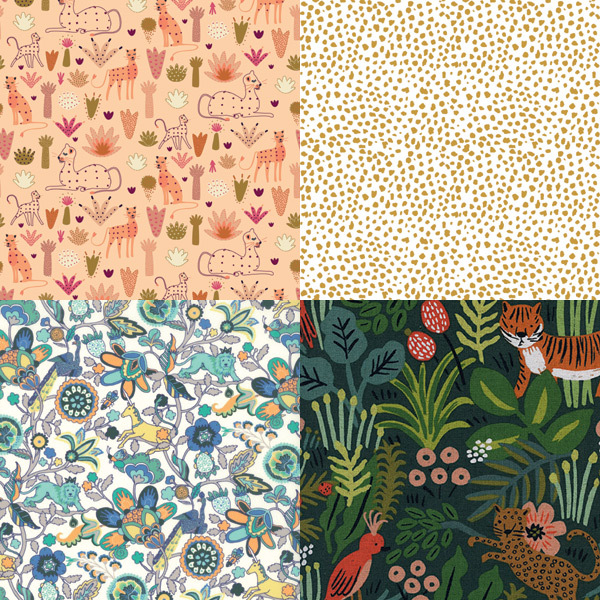 Liberty Fabrics ‘Contemporary Classic’ Queue for the Zoo A (137cm wide). Distributed and sold by The Strawberry Thief. 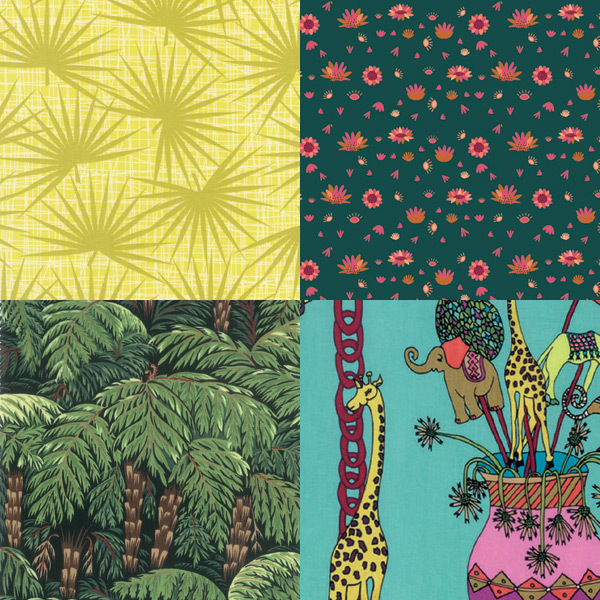 Northcott Fabrics ‘Jungle Friends’ 21799-58, designed by Northcott Studio. Distributed by Lloyd Curzon Textiles. Dashwood Studio ‘Serengeti’ D2286, designed by Elena Essex. Distributed by Two Green Zebras. 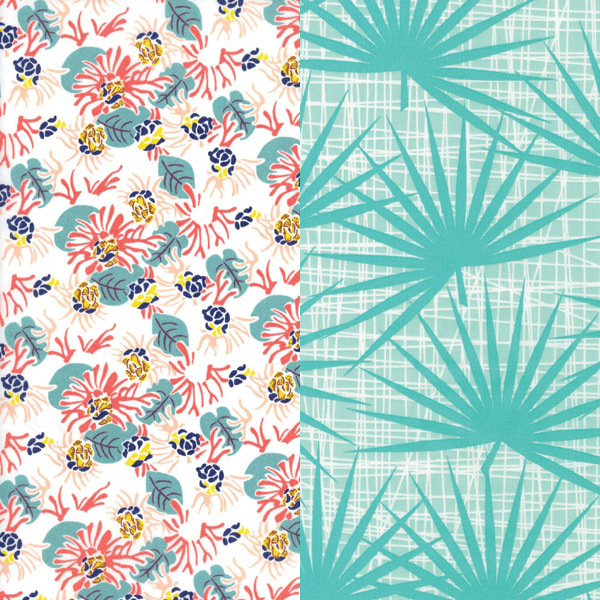 Robert Kaufman Fabrics ‘Palm Canyon’ RK1745958 (Cactus colourway), designed by Violet Craft. Distributed by Two Green Zebras. Dashwood Studio ‘Serengeti’ D2288, designed by Elena Essex. Distributed by Two Green Zebras. Nutex Wholesalers ‘Kiwiana’ Mamaku 88010, Col 101. Distributed by Nutex Wholesalers. FreeSpirit ‘Celebrate’ PWMO017.TRADI, designed by Kathy Doughty. Distributed by XLN Fabrics. Art Gallery Fabrics ‘Utopia’ Dreamlandia Illuminated UT-14500, designed by Frances Newcombe. Distributed by Craft Project – Charles Parsons. Art Gallery Fabrics ‘Here Comes the Fun’ Improv Strokes Citrus HCF-59307, designed by Sew Caroline. Distributed by Craft Project – Charles Parsons. Moda Fabrics ‘Savannah’ 48222-15, designed by Gingiber. Distributed by PK Fabrics. Art Gallery Fabrics ‘Indelible’ Stamped Grove Nightfall IDL-1229, designed by Katarina Roccella. Distributed by Craft Project – Charles Parsons. Sevenberry for Robert Kaufman Fabrics ‘Island Paradise’ RK413132 (Green colourway). Distributed by Two Green Zebras. 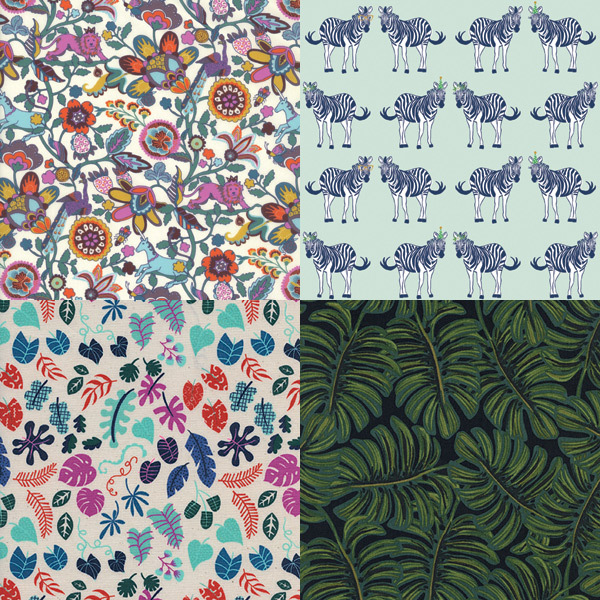 Liberty Fabrics ‘Classic Collection’ Queue for the Zoo E (137cm wide). Distributed and sold by The Strawberry Thief. Cotton+Steel ‘Lagoon’ Leafy Wonder Teal CS1955/02, designed by Rashida Coleman-Hale. Distributed by Dayview Textiles. 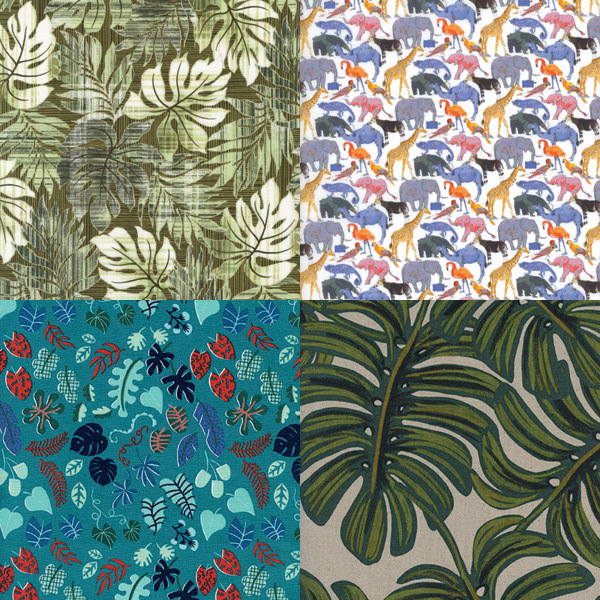 Cotton+Steel ‘Menagerie’ Monstera Natural CS8039/12, designed by Rifle Paper Co. Distributed by Dayview Textiles. Dashwood Studio ‘Serengeti’ D2287, designed by Elena Essex. Distributed by Two Green Zebras. Riley Blake Designs ‘Safari Party’ Animal Print SC6504-GOLD, designed by Melissa Mortenson. Distributed by Millhouse Collections. Liberty Fabrics ‘Little Land of Rhyme’ Mythical Forest B (137cm wide). Distributed and sold by The Strawberry Thief. 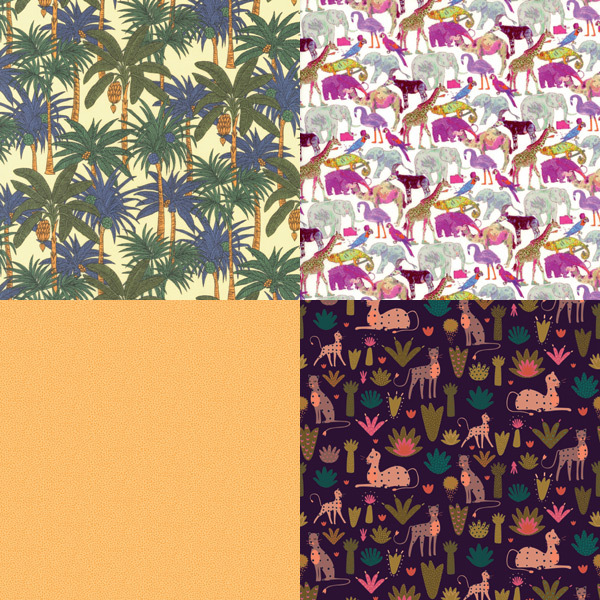 Cotton+Steel ‘Menagerie’ Jungle Hunter CS8041/12, designed by Rifle Paper Co. Distributed by Dayview Textiles. Liberty Fabrics ‘Little Land of Rhyme’ Mythical Forest A (137cm wide). Distributed and sold by The Strawberry Thief. 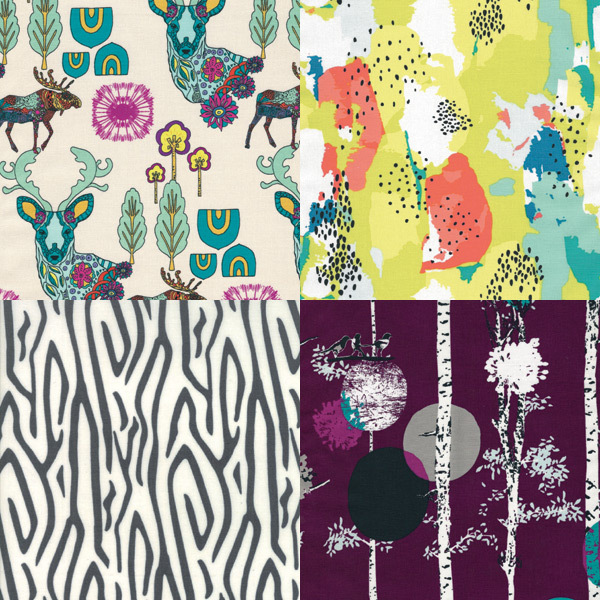 Riley Blake Designs ‘Safari Party’ Main SC6500-MINT, designed by Melissa Mortenson. Distributed by Millhouse Collections. Cotton+Steel ‘Lagoon’ Leafy Wonder Natural CS1955/03, designed by Rashida Coleman-Hale. Distributed by Dayview Textiles. Cotton+Steel ‘Menagerie’ Monstera Midnight CS8038/16, designed by Rifle Paper Co. Distributed by Dayview Textiles. Moda Fabrics ‘Savannah’ 48222-14, designed by Gingiber. Distributed by PK Fabrics. Art Gallery Fabrics ‘Utopia’ Paradise Dwellers Vivid UT-14507, designed by Frances Newcombe. Distributed by Craft Project – Charles Parsons. Liberty Fabrics ‘Castaway’ Birds of Paradise A (137cm wide). Distributed and sold by The Strawberry Thief. Sevenberry for Robert Kaufman Fabrics ‘Island Paradise’ RK412914 (Navy colourway). Distributed by Two Green Zebras. Liberty Fabrics ‘Castaway’ Cactus Jungle A (137cm wide). Distributed and sold by The Strawberry Thief. Robert Kaufman Fabrics ‘Palm Canyon’ RK1745970 (Aqua colourway), designed by Violet Craft. Distributed by Two Green Zebras. – Craft Project – Charles Parsons: 1300 364 422, info@craftproject.com.au, www.craftproject.com.au. – Dayview Textiles: (02) 9607 2724, dayviewt@bigpond.net.au, www.dayviewtextiles.com.au. – Millhouse Collections: (07) 5449 1936, sales@millhousecollections.com, www.millhousecollections.com.